CORNWALL, Ont. 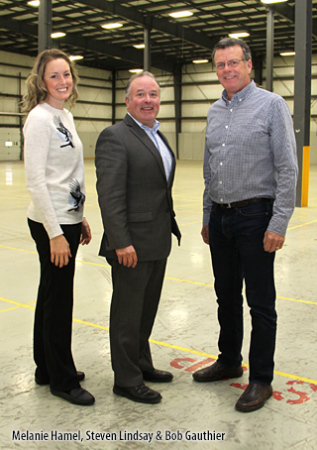 – Seaway Express has acquired a more than 156,000 sq./ft. warehouse in Cornwall Business Park, complete with 25 truck level doors and 30-foot ceilings. The purchases expands Seaway’s footprint in the area, which now manages more than 300,000 sq./ft. of warehouse space in Cornwall. In addition to the extra space, Seaway also expanded its transportation business with a rolling stock investment over $1 million in new tractor trailers. Coming on board with more than 24 years of experience in the transportation sector, Steven Lindsay joins Seaway to pursue new business opportunities. Seaway Express also recently took home some hardware, and was awarded the Canadian Transportation and Logistics’ Shipper’s Choice Award for the fourth consecutive year. From left: Melanie Hamel, Steven Lindsay, and Bob Gauthier.